Traveling abroad and eating good food has never been more educational. 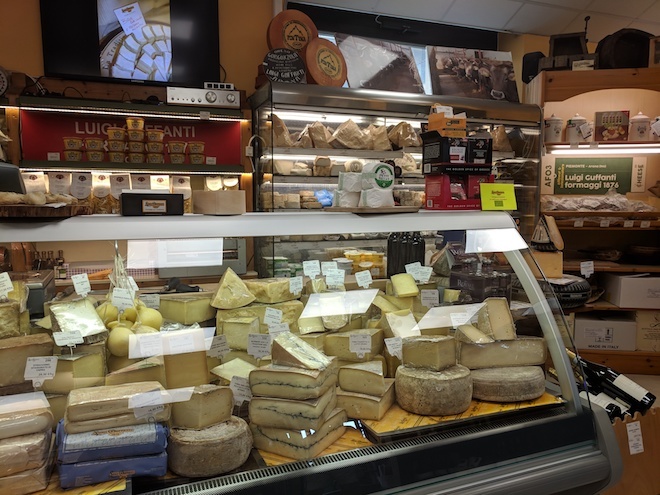 For Bienen senior Ayla Langer, her research project on Italian food culture opened up new career opportunities and gave her insight into a growing movement. Last year, Langer took a class called “Food Art as Counter-Culture,” taught by Italian visiting professor Margherita d'Ayala Valva. The class studied food through the lens of art history. Initially, Langer had enrolled because she wanted to minor in Italian. But the class also piqued her interest in food culture. Together, she and the professor planned a research project to study the chain supermarket, Eataly. Eataly exists as a sort of paradox. On one hand, the company has stores all over the globe – including one along the Magnificent Mile in Chicago. On the other hand, Eataly has deep roots in the Slow Food movement that was started in rural northwest Italy. Founded in 1986, the Slow Food organization strives to preserve “good, clean, and fair” food culture. It supports local agriculture and traditional ways of producing and preparing food. One branch of Slow Food helps connect food artisans to large-scale sellers like Eataly. However, some of the prices are enough to make any college student weep – such as $70 for one pomegranate-scented candle. Professor Nicola Perrulo, who studies food philosophy at the University of Gastronomic Sciences in Italy, discussed this phenomenon with Langer. According to him, gentrification is when something from one socioeconomic plane is raised to a higher one. For example, pasta is a staple of Italian cuisine. In Eataly stores, though, pasta is raised to four or five times the average price. Thus, fewer people can access that part of Italian culture. At first glance, Eataly is definitley gentrifying Italian food. But by interviewing the store's food artisans, Langer discovered there was more to the story. One of these artisans was Giolito Formaggi, who is renowned across Italy for his cheese aging technique. “For him, Eataly provides the largest platform for him to sell his cheese in a way that represents the product properly,” Langer said. In the end, gentrification is about erasing culture. But what makes Eataly unique is that it provides high-quality, traditional products all in a single location without sacrificing the connection to its Slow Food roots. “The stories of these companies are something the industrial sphere has no competition against,” Langer said. Langer plans to continue her studies as a Master of Gastronomy at the University of Gastronomic Sciences. She is a semifinalist for the Fulbright scholarship. For Langer, researching abroad put her on a new path and allowed her to participate in this long tradition of food sciences. Langer also interviewed several Italian citizens, most of whom thought Eataly was too expensive. They preferred to buy fresh produce from local markets. Eataly isn’t taking over local food, but instead filling a different niche entirely. Editor's Note: An earlier version of this article misspelled Ayla Langer's last name. NBN regrets this error and corrected the story on Jan. 31 at 2:15 p.m.